It’s 9:30AM on November 27 and I’m killing time waiting to depart for the airport and our long flight to Buenos Aires, Argentina. High temperatures in Buenos Aires are around 80 degrees and highs in Bariloche are upper 60’s and low 70’s. I can’t wait, even though highs in Denver for Thanksgiving are projected at 55 degrees. My bags are packed, my checklists are marked, and in an hour Jane and I will depart for the RTD terminal where we will board the Skyride shuttle that will transport us to DIA. 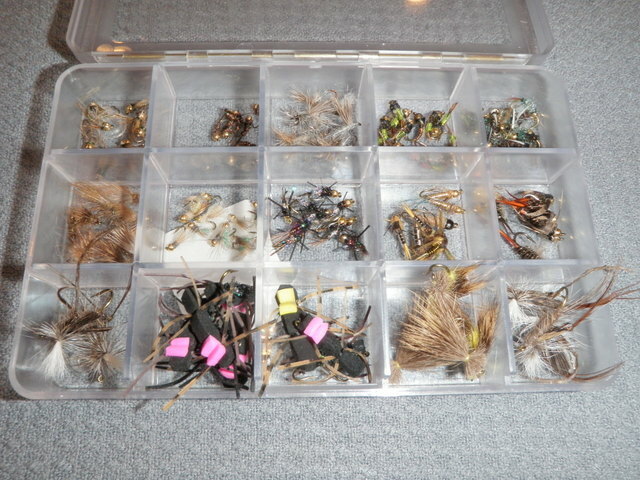 In preparation for the fishing in Argentina I purchased some flies and allocated some of my inventory to an Argentina fly box. In addition Taylor Edrington advised that I should be prepared with some large caddis as Patagonia has a heavy population of these insects. I have quite a few caddis that I tie for Colorado, but they are mainly size 16, so I sat down at my vice and produced some size 14 caddis. I made three with a medium olive body, three Adams gray, three black and three tan. I already possessed three yellow versions that I purchased. I tied these flies with a deer hair tail, brown hackle palmered over the body, a deer hair wing and a grizzly hackle in front of the wing. 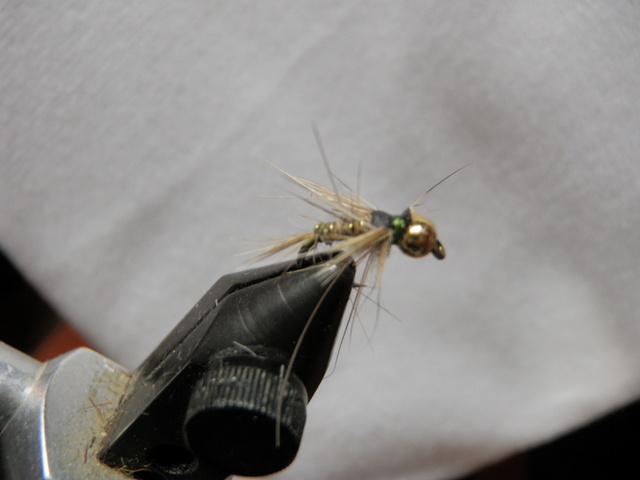 These flies should float well and present a very bushy image on the lakes and streams of Argentina. Another phase of my preparation was to take an inventory of all my go to nymphs and attractors. I created a list with a count of the flies I had and then also noted how many I planned to tie this winter for the 2014 season. My top producer year in and year out has been Dave’s beadhead hares ear nymph and I like to enter each season with 100 of these in stock. My count revealed to me that I needed to tie 44 to rebuild my inventory to 100, so I’ve been busy working on this goal over the last two weeks. In addition I tied 15 for a fishing buddy and packaged them up and put them in the U.S. mail. I tied my beadhead hares ears in the same manner as I’ve used historically, however, I initiated the practice of applying head cement at three critical junctures in the process to improve durability. I noticed that my hares ears tend to unravel just in front of the tail and also just behind the bead, so I dab head cement on the thread wraps just in front of the tail before dubbing the abdomen. Once I’ve tied in the wing case I apply more head cement to the wraps in the thorax area before wrapping the dubbing. Finally I apply clear nail polish to the final wraps behind the bead. Hopefully all these improvements will enhance the durability of Dave’s hares ear nymph. With the first significant accumulation of snow on the ground in Denver and high temperatures of 20 degrees my thoughts turn increasingly to our scheduled trip to Argentina. Jane and I planned a trip in 2012 but Jane experienced an unfortunate hit and run accident while bicycle commuting to work that forced us to postpone our trip. The good news is we rescheduled the trip for 2013 and we are less than a week away from boarding a flight to the southern hemisphere. Late November and early December in Argentina represent late spring as the first day of summer south of the equator is December 21. Warm long days lie ahead and the wintry cold snap that hit Denver only increases our yearning for the vacation departure to arrive quickly. Our trip will include 2.5 days in Buenos Aires and then a seven day stay at Rio Manso Lodge in Patagonia. Rio Manso is a remote luxury fishing lodge located near a national park and in close proximity to rivers and lakes that supposedly represent outstanding fishing. I will spend my time tempting trout in the nearby waters while Jane will sample hiking, kayaking, horseback riding, white water rafting, wine tasting and cooking classes. In preparation for my highly anticipated trip I conferred with Taylor Edrington, my travel agent and owner of the Royal Gorge Angler in Canon City. Taylor has visited Rio Manso numerous times and I asked him to assemble a fly box with the essential “go to” flies that lead to success. 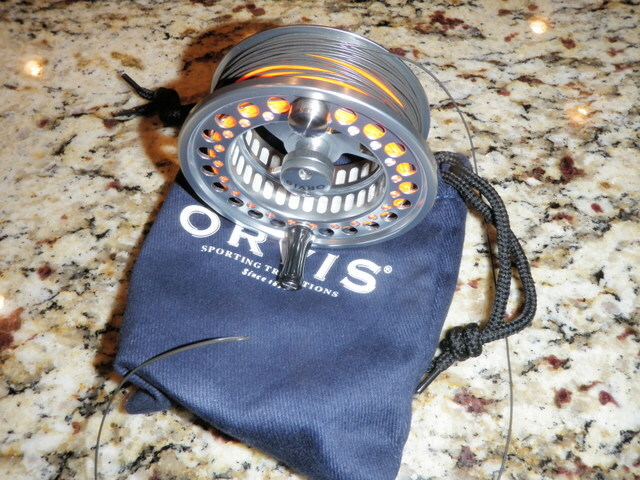 We also discussed equipment requirements and this led to the purchase of a premium sinking tip line and spool that match my Orvis reel for my Scott six weight rod. 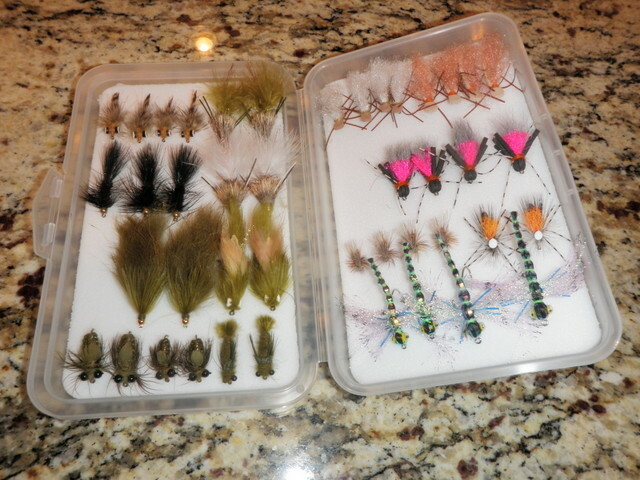 These items will cover situations where I need to strip the large streamers positioned on the left side of my new fly box. In addition to the purchased flies, I plan to transport an assortment of nymphs in case I need to resort to subsurface offerings. Taylor said that most years large attractors and streamers suffice, but nymphs are good to stock as a safety net. I took an inventory of all of my nymphs and attractors and set aside an allocation for Argentina while at the same time noting my tying requirements in preparation for the 2014 season in Colorado. I stocked mostly nymphs for Argentina but also added some hoppers and large caddis to my Rio Manso fly box. According to Taylor the pinnacle of Rio Manso fly fishing is the dragon fly hatch. The timing can vary from year to year, but the first week of December typically matches the beginning of this fun event. Since I rarely fish with dragonflies I purchased a sampling of dragonfly nymphs and adults. I’m keeping my fingers crossed. Stay tuned to this web site for reports on Patagonia fly fishing. I’m getting quite anxious. I am admittedly a chronic numbers guy. The weather forecast for Saturday called for highs in Denver of 60 degrees so I decided to make a quick trip to Clear Creek Canyon in an attempt to build my fish count number late in the season. Jane was scheduled to spend the afternoon in the office working, so I had some unexpected time to myself. I prepared a lunch and headed out the door by 11:30 and arrived at a pullout toward the western end of the canyon by noon. The temperature in the canyon was 53 degrees, but I was concerned by the strong wind I was observing while I munched my lunch in the shelter of my car. Once I pulled on my waders and rigged my rod I decided to wear my ski hat instead of my wide brimmed hat for warmth, and I concluded that I’d be fishing in the shadow of the southern canyon wall most of the time thus not requiring a hat brim. I walked down the highway a bit and then angled down the steep bank to the water just above a spot where the creek narrowed and churned through a chute. I tied on a Chernobyl ant and a beadhead hares ear and began prospecting the water along the right bank, but didn’t meet with any success until twenty minutes or so elapsed. At this point the Chernobyl dipped and I hooked and landed a small seven inch brown. I continued moving along the bank next to the road, but I wasn’t seeing any more fish or attention to my flies. What I was seeing was ridiculously strong gusts of wind that prevented me from casting or even facing upstream. I turned my back to the wind and waited for extended periods for the wind to subside before resuming my ineffective casting. My wet hands became extremely chilled by the evaporation and in truth I began to think more about the warmth of my home than the prospect of continuing to fish in these adverse conditions. After another 45 minutes fighting the wind and intermittent fruitless casting, I flicked a short backhad cast to a pocket behind an exposed boulder and once again detected a pause in the Chernobyl and set the hook and landed a nine inch brown trout. It was somewhat gratifying to catch another fish after battling the elements, but I now decided I wasn’t really having fun, and wasn’t the goal of fishing to have fun? I resumed my progress upstream for another half hour or so, but the gusts of wind became more frequent and lasted longer so I reeled up my flies and hooked them in the rod guide and returned to the car. I opened the side door of the Santa Fe to rest my jeans and shoes and socks on the seat while I removed my waders. Several times I had to chase down my socks and even my waders as the wind picked them up and moved them away from the car. When I finally returned to the tailgate I removed my glasses from their case and placed the case on the floor of the car while I switched my fishing sunglasses for my regular wire rims. Just as I did this, a monster gust came along, and when I reopened my eyes, I discovered that the case was no longer in front of me. I searched every corner of the car and can only assume that the wind swept the case through the car and out the side door and deposited it somewhere in Kansas. Later I realized that my Texas Rangers ball cap was also missing, so it must have met the same fate as the sunglass case. Needless to say it was a frustrating fishing outing and certainly discouraged me from making future fishing outings in Colorado in 2013. The weather will need to be considerably nicer before I venture to another stream, and the numbers can remain where they are. November is typically a tough month for fly fishing, although occasional fair weather can offer some decent action. Highs for Denver were projected to be in the upper 60’s on Sunday November 3, and I knew there weren’t many more opportunities remaining in 2013, so I planned a fishing trip. Jane picked up a nasty cold early in the week, and I woke up on Sunday suspecting that the bug had somehow transferred to my body, but once I experienced the sunshine and warm temperatures, I couldn’t resist making a fishing trip. I considered Clear Creek Canyon, Waterton Canyon, and the South Platte River below Deckers. The flows below Strontia Springs in Waterton Canyon were only 40 cfs, and that is extremely low and suggests very tough fishing so I removed that option from my list. 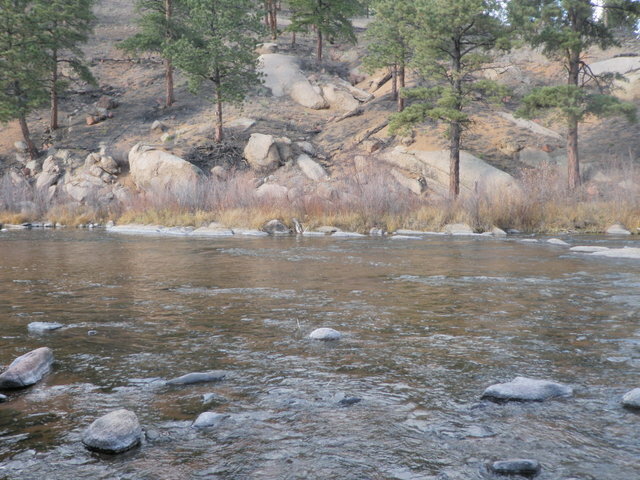 The South Platte River below Cheesman Canyon was flowing at 110 cfs and that is on the low side but not impossible. I’d been to Clear Creek Canyon on Thursday, and I knew the narrow canyon walls would block the sun so it could be chilly even with Denver air temperatures in the upper 60’s. 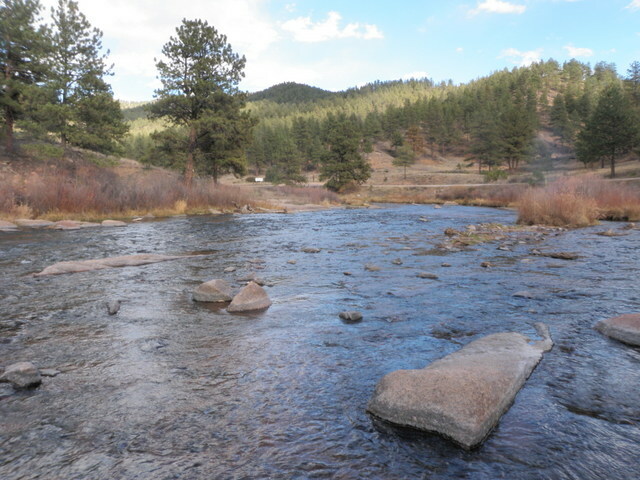 The South Platte River below Deckers on the other hand is a wide open stretch of water that soaks up a lot of sunshine. The South Platte was my choice for Sunday. I left the house at 10AM and by 11:15 arrived at the large parking lot across from the river just downstream from the junction of Nighthawk road and the road that goes along the South Platte River. I quickly pulled on my waders and put together my Loomis five weight and entered the water directly across from where I parked. Another fisherman was in the pool thirty yards below me so I began working my way upstream. 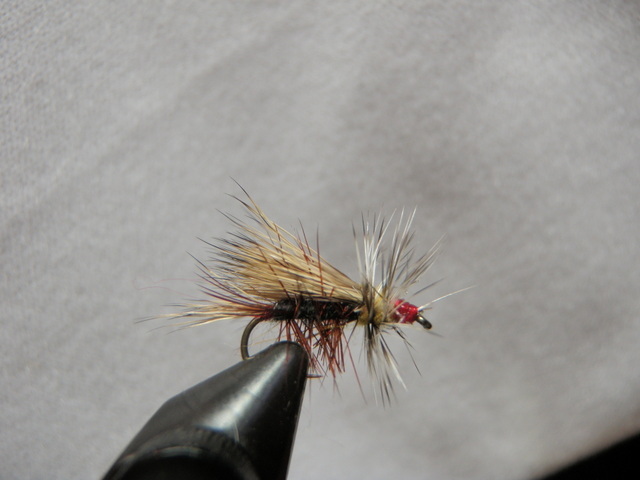 I began with a Chernobyl ant, beadhead hares ear and beadhead RS2. The reports I read suggested that BWO’s and tricos were still hatching so I expected to have action on the RS2. After a few prospecting casts I spotted a nice brown positioned to my left and eight feet upstream. I began casting above the fish and allowed my three flies to drift over the fish and on the third pass I noticed the fish make a slight move so I set the hook. Instantaneously the fish rocketed upstream and began stripping line from my reel so I allowed the handle to spin and waited to gain some control. After a 25 foot sprint directly upstream the fish made a quick turn and instantly my line was limp. I reeled up my line and discovered that the hares ear and RS2 had broken off. I’m not sure if I had the fish hooked in the mouth or foul hooked but any fish that can streak that fast is usually foul hooked. I took a deep breath and tied another hares ear and RS2 below my Chernobyl and moved on along the left bank and around a bend in the river. I was covering deep attractive areas in the middle of the river quickly as I felt most of the fish would be along the bank. After turning the bend I waded across some shallow riffles and approached some attractive runs and pockets along the north bank. The lower deep runs did not yield any action so I moved up 25 feet to a spot where the river runs along a large rock and log and then creates a small pocket before spilling over some large rocks. Here I spotted a refusal to the Chernobyl, and then I observed the same fish rising two or three times to something tiny on the surface. It was about the time when trico spinners might hit the water, but I decided to try a CDC BWO first, and this tiny fly did in fact arouse another refusal. Unfortunately I tried to place a subsequent cast tight to the log and then allowed it to drift deep into the pocket and snagged a submerged branch. In my effort to save the fly I disturbed the tiny pocket and put down the fish so I decided to return to the car and take my lunch break. It was 12:15 as I crossed the river again and then walked back along the bank to the road and back to the Santa Fe. Another SUV had arrived and parked next to me and a couple were fishing in the area where I began in the morning. As I ate my lunch, the fisherman who was below me when I began walked by and I didn’t pay much attention to this circumstance. After lunch I put on my frontpack and backpack and returned to the spot where I’d exited for lunch, and I was anxiously anticipating working upstream through some additional juicy pockets and runs along the north bank. Unfortunately I discovered that the fisherman who walked by the car while I ate lunch was now positioned across from a deep run no more than 15 yards above where I wanted to fish. I didn’t feel it was proper etiquette to resume fishing where I’d quit as I would have been crowding the upstream fisherman, so I returned to the car and drove up along the river to another spot. The spot I chose was either a campground or picnic ground and it was the next parking area after Osprey Campground. Another SUV was already parked here and two fishermen were preparing to fish, so I hastily grabbed my gear and walked down the road 100 yards or so and entered the river a short distance below the road. I began prospecting my way upstream along the left bank next to the road and after covering thirty yards, I lifted the flies to recast and felt weight so I set the hook and a twelve inch brown launched itself out of the river. I played the strong fighter for 15 seconds and it swam under a branch that was lodged in front of a large exposed boulder. I didn’t see the branch from my downstream vantage point so I didn’t attempt to prevent the escape move. Unfortunately it worked for the brown trout, and when I waded closer and unhooked the Chernobyl I discovered that two more flies were missing along with the fish. I screamed and uttered some choice words and tied on another pair of nymphs and then worked upstream further. The wind really kicked up at this point and I was having great difficulty punching casts upstream. I covered quite a bit of real estate and came to a shallow smooth stretch of water and I could spot two fish hugging the bottom in the clear two foot deep water. I decided to clip off the three fly set up and tie on a CDC BWO again, but by the time I did this, the lower fish disappeared. I did spot a subtle rise along the subsurface weed bed further upstream so I shot some casts to that vicinity, but these casts proved fruitless and I never saw another rise. I was pretty frustrated at this point with the loss of two fish, the lack of action, the wind and the nondescript smooth shallow water that was ahead of me so I climbed the gradual bank and returned to the car. On top of all this frustration I now noticed that a campground host had come by and put a fee envelope on my windshield. I now noticed that I parked in a fee area and there was a tube in the parking area to deposit payment. The host had filled in my envelope for me and I quickly discovered that I owed $6 for a day use fee. I checked my wallet and of course I only had twenties plus four ones. I was about to put the four ones in the envelope when I noticed there was a space to enter my senior pass number. Whether it was proper or not, I assumed that the senior pass entitled me to a 50% discount, so I entered my senior pass number and deposited three ones in the envelope. I now decided to drive further upstream, but after covering a couple miles and noticing that all the pullouts had one or two vehicles and numerous fishermen, I did a U-turn and drove back toward the Nighthawk Road junction. I was still in my waders so I needed to find a parking spot to remove them, so I pulled into the lot directly across from Nighthawk Road. There were no vehicles in the parking lot so I decided to return to my exit point for lunch and resume fishing upstream. I still had the CDC BWO on my line so I made some downstream casts to the exact spot where I’d experienced refusals just before lunch, but in the late afternoon the BWO didn’t even generate a look. With the wind and sun glare it was very difficult to see the tiny fly so I reverted to the three fly setup; Chernobyl ant, beadhead hares ear and RS2. I cast the three fly combo across and let it drift through the small pocket at the end of the run and on the third or fourth pass a fish grabbed the trailing RS2. This fish put up a strong fight and I played it cautiously as I didn’t want to lose another prize catch. Eventually I was able to lift the nose of a nice 13 inch rainbow above the surface and slid my net beneath the first catch of the day. Some additional nice water remained along the bank for another forty feet before the ledge rock next to a deep run that generally holds several fish. I carefully covered this water and in another short deep pocket the Chernobyl dipped and I set the hook and fought and landed another mirror image rainbow. My day was suddenly looking up and I was anticipating continuing my progress upstream and along the north and then west bank. But as this was going on two fishermen appeared and entered the river directly across from the ledge rock! I fished out the pockets but when I was within 15 yards I waded back across the river and circled around and above the pair of young fishermen. When I came back to the river I was above a 90 degree bend and now the sun was quite low in the western sky and shining directly into my eyes. I crossed to the opposite bank so the sun was at my back, but this created a difficult glare and it was hard to read the water depth. I made a few futile casts to no avail and then crossed back toward the parking lot and walked up the path along the river quite a distance. The water in this area was wide and shallow and largely unattractive to me so after hiking 200 yards or so and making a few half hearted casts in the right channel next to an island, I reeled up my line and decided to call it a day. I was quite pleased to avoid a skunking and land two decent rainbows late in the day. It was still a gorgeous day for early November and I’ll relish any late season action as a bonus for 2013. Jane and I purchased a 157 piece bag of assorted candy to disperse to trick or treaters on Halloween 2013. We agreed to turn off the lights and head out to dinner once the candy was gone. What time would you guess we departed for Wahoo’s for some delicious Mr. Lee’s pork tostadas? Most normal people are not thinking of fly fishing on Halloween, but I’m probably not a normal person. The weather forecast called for temperatures in the high 50’s in Denver and I was in a good position to take a day off work, and Jane and I reached a decision not to purchase a second house in Eagle Ranch, so I decided to make a short return trip to Clear Creek Canyon where I experienced decent success catching small brown trout on October 10. I knew the air temperature would be quite chilly in the tight canyon in the morning so I took my time getting ready and departed at 11:15. As I drove west on I70 and then crossed to route 58 in Golden I noticed quite a bit of wind that caused the leaves that remained on trees to flutter and swayed the tall grass and branches. The dashboard thermometer dropped to 42 degrees as I progressed west in the canyon and I looked for a stretch of water that was exposed to the sun. By mile marker 166.5 I discovered a nice stretch where the stream flowed on the north side of the highway and the south wall of the canyon was lower thus allowing sunshine to stream into the streambed below. I parked in a pullout on the south side of the road and prepared to fish by adding several layers of warm clothes. As the sun was out when I began, I elected to wear my wide brimmed cowboy hat, but I would have preferred the warmth of my ski hat. I dropped my reel containing my sink tip line in my backpack as I planned to include some streamer fishing in my afternoon casting, and once I was prepared to begin fishing I returned to the driver’s seat in the Santa Fe and ate my lunch as it was now close to noon. After lunch I carefully crossed the highway and found an angled path down the steep bank to the stream below. I noticed another fisherman in the next pullout east of my location, and once I descended to the creek and looked downstream, I noticed him fifty yards below me. To allow the other fisherman more space I walked upstream a bit to a nice area where Clear Creek spread out and created some nice deep pools along the edge. I had my 5 weight Loomis so I tied on a Chernobyl ant and beadhead hares ear and began prospecting the water. Since during the previous trip I had the most success along the bank, I continued with this strategy, but did cast to some juicy midstream locations on the rare occasions when they presented themselves. I fished for a half hour or so through some juicy pockets and pools along the left bank with no success, although I kicked four or five nice fish out from lies tight to streamside boulders. These fish were on average larger than the fish I landed on my previous visit on October 10. After covering the nice water up to the head of the pool I encountered a wide shallow riffle stretch so I crossed to the north bank and began prospecting the attracive locations on the side of the creek away from the highway. I normally like this strategy as I believe most fishermen do not take the trouble to cross and therefore the fish are less pressured. For the next two hours I worked my way upstream and landed three brown trout roughly 10-11 inches long. Two of the fish slowly rose and sipped the Chernobyl ant and one grabbed the hares ear nymph in front of a submerged boulder. In addition I hooked two rainbows I did not land and toward the end of this period at around 2:30, I hooked a brown on the hares ear as I lifted to recast, but this fish also managed to shake loose from the hook point. During this time some clouds moved in and blocked the sun and the wind began to gust to the point that I had to stop fishing and turn my back several times. The combination of the wind chill and the icy water temperature caused me to stop several times and attempt to warm my hands and feet by standing out of the water and thrusting my hands in my pockets. I had my sungloves on and when I landed a couple fish they got wet and the cooling effect of the evaporation during the wind gusts caused my fingers to curl and lose feeling. By 2:30 I’d reached a point where the stream narrowed between vertical rock walls and I wasn’t prepared for difficult rock climbing or challenging wading so I retraced my path and crossed back to the south bank at a wide shallow spot. I carefully climbed the steep bank on my numb feet and returned to the car where I exchanged my wide brimmed hat for a ski hat and pulled out my neoprene fishing gloves to replace my sungloves. Once my fingers regained feeling I swapped the reel with the tapered leader for my sink tip line and clipped the tapered leader back to a length of four feet. The leader at this point was probably 0X but supposedly fish are not leader shy when chasing a streamer so I knotted on an olive woolly bugger with a black tail to the thick leader and then crimped a split shot just above the eye of the fly. I crossed the highway and walked downstream to a point where the stream narrowed to a white water chute and descended here to work my way back upstream with the woolly bugger.I experimented with different approaches including upstream dead drift, across stream while allowing the fly to sweep down and across, and finally I’d cast directly across and then begin sporadically stripping line. The woolly bugger exhibited great movement as it dipped up and down due to the split shot near the eye of the hook, and the soft marabou and hackle undulated in the current like a live source of food. I covered quite a bit of water in this manner until I approached a spot where the main current angled against the far bank and the flow scoured out a nice deep pocket in front of me. I cast along the current seam and allowed the bugger to tumble downstream on the sinking line. Next I cast to the very top of the pocket and after allowing the streamer to sink, I began to strip it across the five foot midsection of the pool and as I lifted the fly to recast, I noticed a small brown following. This continued until on the fourth pass through the pool I felt a bump so the brown had apparently grabbed the tail of the bugger. Finally on drift number five I’d tormented the brown into attacking the woolly bugger and I set the hook and stripped in a nine inch brown trout. 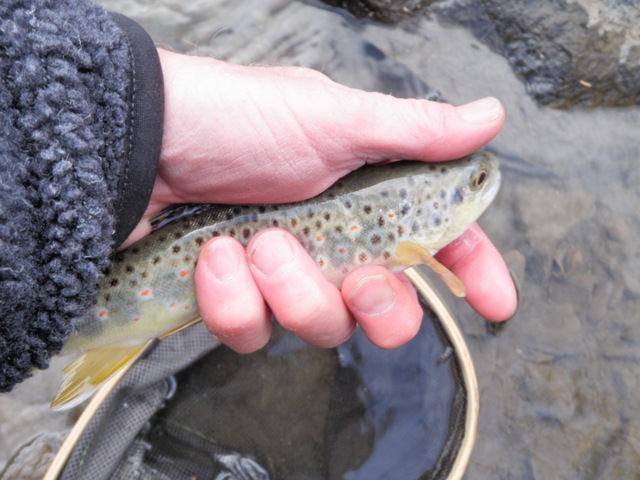 This small success renewed my enthusiasm for stripping the streamer so I proceeded upstream working all the likely water that might hold cantankerous trout that might strike out at the invading woolly bugger. Unfortunately after another half hour of fishing I hadn’t aroused any additional action and I was once again suffering cold hands and feet so I reeled up the line, climbed the steep bank and called it a day. Although four fish does not seem like a successful outing, I regard it as a significant achievement due to the adverse conditions. 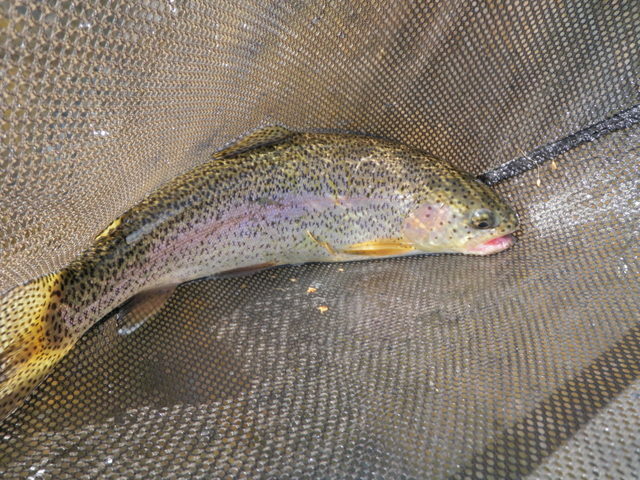 I tested out my long dormant sinking line and managed to land a trout. 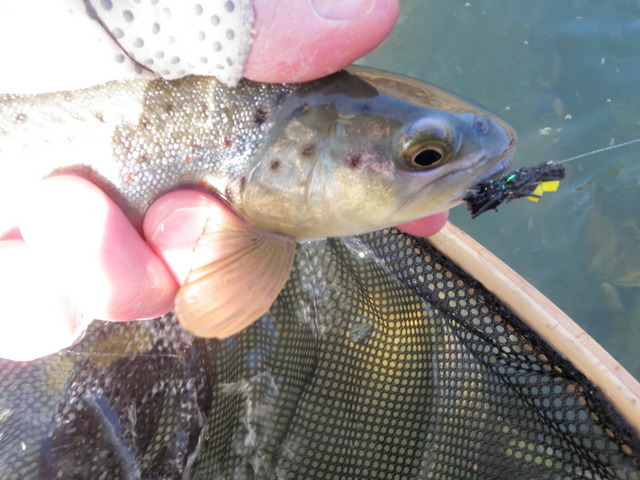 In addition I landed two trout on a Chernobyl ant, a large dry fly, on October 31. Surface action late in October is something to appreciate. Had I worn my ski hat and neoprene gloves from the start, I feel that I could have weathered the wind and cold better and perhaps picked up a few more fish. I glanced at the thermometer in the Santa Fe as I began my drive back to Denver and noted that the air temperature had risen to 49 degrees. Once within the city of Denver it topped out at 54. Jane had already come home from work when I arrived and we prepared for the onslaught of trick or treaters. The first costumed kid rang the doorbell at 5:30 and we distributed 140 goodies by 6:45. I was feeling quite hungry by this point, so I suggested to Jane that we leave at 7PM even if there was remaining candy in the bowl. There was no need for this contingency plan as the candy disappeared by 6:55 and we were on our way to Wahoo’s. We are teaching our children greed at an early age. I’m not sure whether chocolate Easter egg hunts or begging for Halloween candy take the prize as the most despicable holiday acts of greed. At one point the doorbell rang and I answered and was faced with a small group of princesses, butterflies, Draculas and Spidermen. However I noticed an adult woman standing off to the left side of the group so after reaching out the candy bowl so the youngsters could claim their booty, I mentioned that the adult “appeared to be a bit old to be trick or treating”. She replied that she was representing her “little one” and nodded toward the crowd on the sidewalk. To this I responded, “Can your little one eat candy?” She nodded briefly and made a hasty retreat down the steps to join her group. Like other holidays, Halloween has morphed into a money making event for the costume and candy industries. How much candy can one child or family consume?